A psychedelic jam band from 1981 - 1993 located in Albany, NY, this band was founded by husband and wife team Deb and Paul Cavanaugh. The name came from the idea that they played a very eclectic style of music that didn't fit into any one niche. The band had various members and configurations that always included the founders. Playing a mix of covers and originals, this band had a wide following that crossed all boundaries. It was common to find bikers, down-home country music lovers, punks, metal heads and deadheads at the same show, all communing to G.E. 's music. Debbie Blais and Paul Cavanaugh met in 1974 in Stamford, Connecticut and, on January 1st, 1975, hitchhiked across the US, landing in San Francisco, California. They earned their living busking on the streets of the city until they moved to Santa Cruz and started raising a family. No longer able to hitchhike, they traveled by VW bus and various cars from coast to coast before finally settling down in the Albany, NY area in 1981. There they started their first rock & roll band, Cosmo Rock. Their first gig was in Schenectady in sight of the famous General Electric sign. 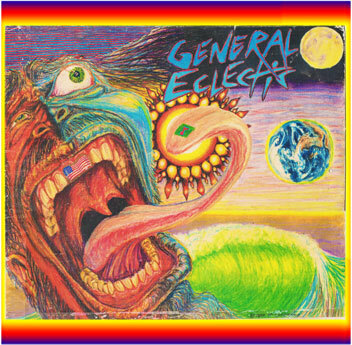 Recognizing that their music could only be described as eclectic, they soon formed a new band, and General Eclectic was born.